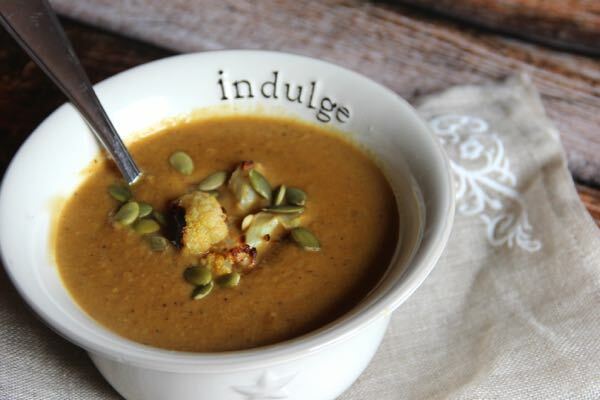 Soup is so good for the soul, especially during our long Michigan winters or beautiful late Michigan fall weather. My family knows we have transitioned into fall mode once soups and stews become regular fare at dinner. Though my family prefers noodle based or heartier soups and stews, I like a feel good/taste good bowl of vegetable based deliciousness. I will often make a big batch of a Recipe Rebuild soup at the start of the week and enjoy it for multiple lunches throughout the week. This keeps my lunches easy, fast and of course healthy! In this particular cauliflower soup recipe, curry was added for a whole new depth of flavor. 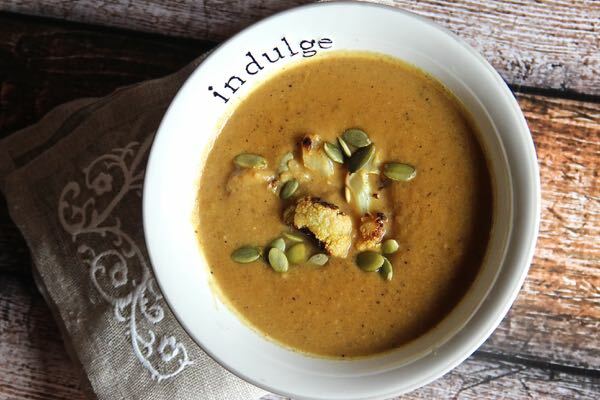 By roasting the cauliflower first, the soup gains even more flavor through the caramelization process. Coconut milk adds a subtle delicate balance and if I had roasted chickpeas around, I would have garnished it with those. Cauliflower is low in fat and carbs but high in dietary fiber, folate, water, and vitamin C. Cauliflower is a cruciferous vegetable and like the other cruciferous vegetables, it is known for high concentration of cancer-fighting chemicals called glucosinolates. Preheat the oven to 400 degrees F and drizzle a large baking pan with 1 tablespoon of olive oil. Add cauliflower and onion to the pan and toss to gently coat in oil, roast for 30 minutes turning once during the cooking time. Heat the additional tablespoon of olive oil in a large soup pot and toss in the garlic, until fragrant. Add the ginger, cumin and curry to the garlic and toss well, toasting the spices until they are also fragrant. Pour the coconut milk in the pot as well as the stock. Add the roasted cauliflower, onion and potato to the pot and simmer on low to medium heat until the cauliflower is very tender when pierced with a fork, about 40 minutes. Taste and adjust seasonings as desired and using a handheld immersion blender puree until smooth or until half pureed to leave a little texture. If you do not have an immersion blender, working in batches carefully puree in a blender until smooth. Transfer to soup bowls, garnish and enjoy!